CURE Childhood Cancer just announced record donations of $3.1 million received in its just-concluded fiscal year. This represents about a 200% gain in annual giving since they became a client of Guest Relations Marketing in 2007. This has been accomplished primarily through activating their Zealots through online media and events. More importantly, this has resulted in tremendous advances in research. We are striving for the ultimate success story – finding ultimate cures for childhood cancers. It is coming! New Media – Same Old Response Rates? Recent report from Admap: an average of 0.5% Facebook fans interact with brands in a given week. Pretty low response, eh? Which is why direct marketing with average response rates of 1 – 2% is still a viable media option. Every time a new touchpoint is invented, people and especially marketers rush to put it into an existing bucket. We love what social media offers marketers. There is clearly a place for Facebook and other social media. But to consider it a replacement for other aspects of a marketing mix is a major mistake. Every media has its strengths and shortcomings. It is natural to want to embrace the new. As consumers, we are curious about what we’ve not seen or touched before. As marketers, we want to try the newest media or promotional invention, if for no other reason than the fear of competitively being left behind. A recent briefing from Trendwatching.com highlights the reasons behind an exponential growth of “new” products and services. This is a powerful roadmap for building enduring brands… new or old. Haven’t you heard!? A lifeguard in Florida was fired for vacating his zone to save a man drowning in unprotected waters 1,500 feet south of his post. The young man worked for Jeff Ellis and Associates, an aquatic safety contractor. Naturally, this decision has created a serious uproar online, sending Twitter and Facebook into public disapproval. 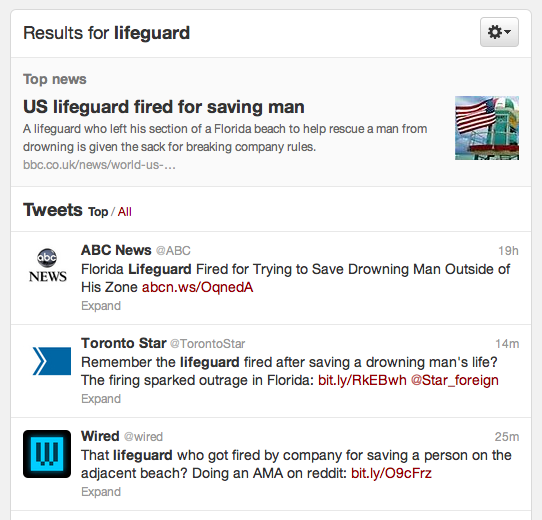 In fact, if you search “lifeguard” on Twitter your timeline will be updated on a second by second basis with hundreds of tweets sharing the news story and opinions on the situation. The overall consensus? The general public is outraged that a man who reacted on his instincts and training to save a dying individual would be reprimanded, rather than celebrated! This burst of social media presence is not uncommon. In fact, if the news is worth knowing, it will be shared. That is the brilliance, yet fear that all companies are aware of in today’s day and age. Or are they? Jeff Ellis and Associates should have considered this before they took action on Tomas Lopez, the lifeguard who was terminated. Before any decision is taken publicly, a company should always weigh decisions and strategy based on the potential viral reaction and impact. Take the story posted by ABC News as an example. Less than 24 hours after the article was posted, it had over 1,400 Facebook shares, 392 Tweet shares, and 240 comments. 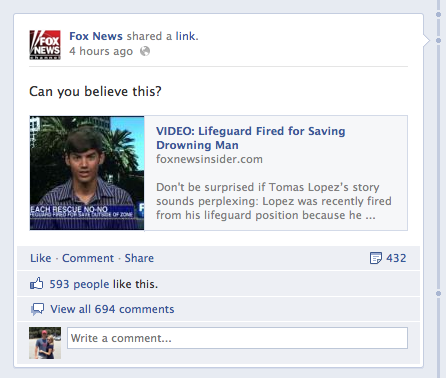 You could also go to Fox News’ Facebook page to read about the story. In only four hours after posting, the story had received 694 comments and 432 shares. Realizing the outcry through social realms and the backlash it was having on the company, Jeff Ellis and Associates attempted to save face by offering Tomas his job back. Tomas’s response was a big fat, “NO THANK YOU” that only fueled the flames of everyone who believed the man was doing the humane thing, backfiring again for the aquatics safety company. The lesson learned for all companies, whether small or large? Take a step away from policies, rules and regulations and put yourself into the general public’s shoes. Ask yourself, “How could this be perceived by an individual who does not understand the legal jargon associated?” Even if the legality of the situation cannot be avoided, taking the precautionary step can at least prepare you for an adequate public address and response to critics. 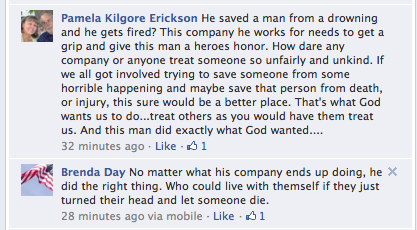 Because today, destroying a company’s reputation is as simple as 140 characters. 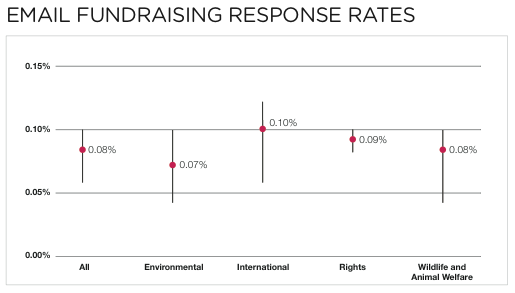 Yesterday we promised to discuss the 2012 eNonprofit Benchmarks Study’s findings on online fundraising. And here at Guest Relations Marketing we always provide on our promises. As the economy has improved, general giving has increased. As a result, these numbers can be directly correlated to the incline in the number of online donations that most nonprofit organizations are witnessing. However, it is important to understand the trends in how people are giving and through what mediums. Below you will find a synopsis of some of the important takeaways as we explain what these mean to your organization. 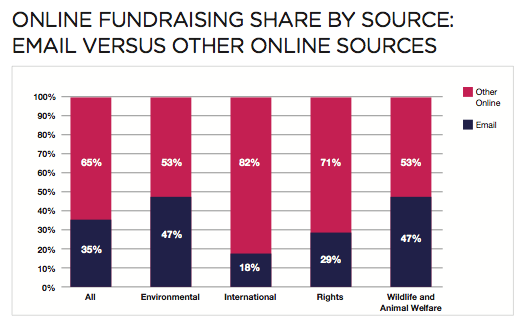 A majority of online giving is coming from sources other than email. As a result organizations should NEVER exclude providing additional opportunities for people to donate. Consider unsolicited web giving and peer referrals as other great sources for fundraising. How can you increase peer referrals? Social sites that promote sharing and make it easy for people to talk about your organization provide excellent word of mouth marketing opportunities. If you aren’t in these mediums (Facebook, Twitter, etc.) than you should consider doing so immediately. 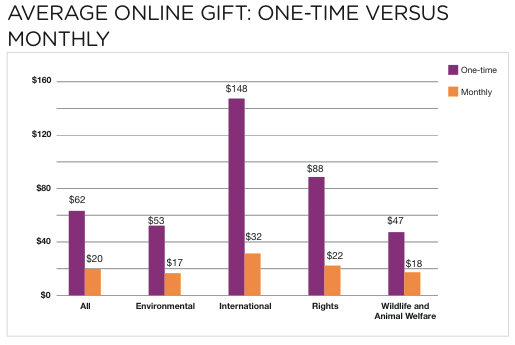 While one-time gifts remain the largest source of online revenue for participants, online revenue from monthly giving is growing at a much faster rate. While one-time gifts are generally of higher value than monthly giving, keep in mind that the total dollar value for continuous donations will be higher. Consider establishing brand loyalty amongst your fans and provide opportunities for them to give over and over again throughout the year. Maybe this is done through a series of events or establishing a monthly loyalty plan. Either way, keeping your organization top of mind will promote continuous giving. Encouraging and promoting online fundraising isn’t always an easy task. Thankfully social media has enabled organizations multiple channels to spread the word. 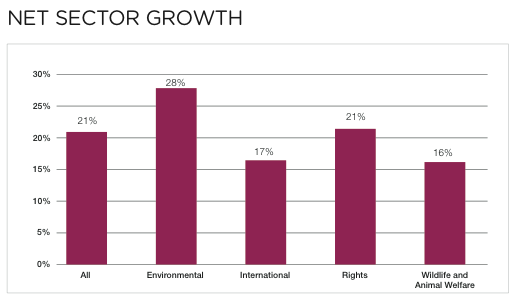 Interested in how most nonprofits stack up in the social realm? Check in tomorrow when we summarize the benefits of having a strong social media presence. Marketing, Metrics and Measurement, Oh My! 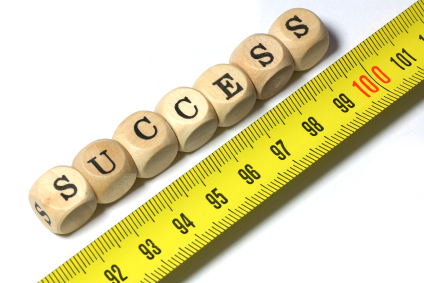 Ask any marketer in the world and they will tell you that it is important to measure your marketing efforts. Because if you don’t monitor metrics that report the significance of what you are (or aren’t) doing, then you will never have any idea if you are doing the right thing. Why is this so often the case? Well, I could tell you because updating spreadsheet after spreadsheet is often tedious. Or maybe you would prefer the answer that marketers are so fixed on doing that they forget to look back and observe what they’ve done? I believe that the true answer lies into a little of both. As a marketer I want to put the client first. I want to share their content, brainstorm for their brand, and dream of the next viral campaign. However, the more time I spend on thinking of the future without observing the past, the higher the risk I run of heading straight down a path to NOWHERE. My point? Take the time to measure your initiatives and understand how your marketing efforts are performing. I promise that it will only provide insight that will enable you to be a better marketer. And in the end, isn’t that what we all are striving to become? Guest Relations Marketing is almost six years old. We’re still a kid. And, we only recently instituted our intern program. So, what is our track record? We’ve had three interns. Two we hired permanently. The third? Currently working for an online agency. The partners of Guest Relations established an intern program at their previous agency. The program became so renowned that other agencies called to interview and hire our interns. Tell us why. Email April: avoris@guestrelationsmarketing.com. Submit to April Voris at avoris@guestrelationsmarketing.com. It was recently announced in the automotive trades – “Ford and GM renew a bitter rivalry.” Despite their financial issues, both companies clearly have “zealots” for both their overall company as well as specific branded vehicles. As a zealot for Mustangs, a Camaro, no matter how “transformed,” is simply second rate. Great brands have zealots. They also have arch-rivals. One of the tenets of marketing from Steve Jobs: overtly identify and make known your enemy. It is core to great branding. If you make it clear what you stand for, you necessarily stand against something else. Who is your brand’s enemy? What are the great rivalries of zealotry brands? Here’s some that quickly come to mind. What is your best example?